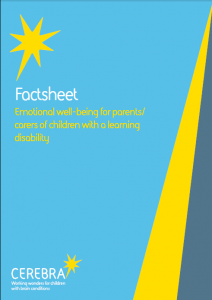 This guide aims to highlight the importance of your own emotional well-being as a parent carer, provide information about factors that may have an effect and help you navigate and access the information, support and resources that are available. Why is my emotional well-being at risk? Who can I contact if I am worried about my well-being? How can I look after my own well-being? What further help is available to support me when parenting a child with a learning disability?